Silver Martens are recognized by their silver-tipped fur. Known for his cute expressions, unique coloring and charming personality, the Silver Marten breed of rabbit has been a favorite for nearly a century! The Silver Marten HistoryThe Silver Marten breed of rabbit was originally a naturally-occurring mutation in the coats of Chinchilla-colored rabbits. Some say these strangely-marked little black rabbits occurred early on, while others say it was the cross-breeding of Black and Tan bloodlines that created the Silver Marten. According to the Silver Marten Club, these mismarked Chinchillas occurred on their own, but that the Black and Tan was later introduced, in an attempt to improve the clarity of color and markings on these bunnies. This seems a logical explanation, particularly when one sees the similarity between the Silver Marten and Black and Tan markings.It was in 1924 that the Silver Marten rabbit was finally given his name and, by 1927, they had developed a working standard for the black and chocolate Silver Marten. These were accepted by ARBA (American Rabbit Breeders Association) and the first breed club came into being. A third variety, the blue, was accepted in 1933 and sixty years later, in 1993, the sable silver was approved. Silver Marten rabbits can also be found in lilac – a light dove gray – but the color is not registerable at this point in time. A compact breed, the Silver Marten rabbit usually weighs in between 6.5 and 8.5 pounds as a senior (a mature adult, 6 mos. or older). Their ears are held upright and are of a medium thickness with good length. The Silver Marten’s eyes are alert and bright, and should compliment their variety – the darker shades having dark brown eyes and the diluted shades having blue-gray eyes. The body of the Silver Marten is firm without being bulky and should be well rounded from the shoulders and up over the hips, having an almost half-moon appearance when properly posed. Their hips are well-developed and should not pinch in at the table. They often have a muscular look that makes them seem larger than what they actually are. The Silver Marten comes in 4 recognized varieties: the black, the blue, chocolate and sable. All possess the same characteristic white around the eyes and nose, inside the ears, the underside of the rabbit and the light silvering along the sides. The lilac, a dilution of the chocolate Marten genes, often occurs in the breed. This color is not accepted in the breed standard, however, though these bunnies do make fantastic pets. The Silver Marten is known for being a charming little clown and terribly curious. 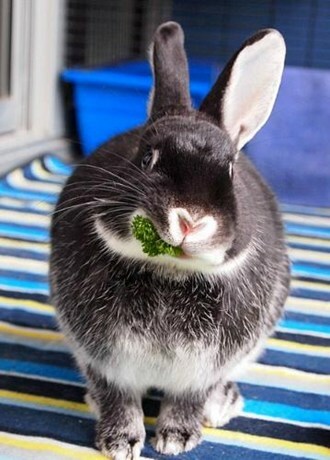 They can, however, be a bit on the skittish side and startle easily – for this reason, one may look for a calmer breed if they are looking for a first bunny for a younger child. They are a delightful companion for older children and adults though, and their markings give them a cute appearance that few can deny. Silver Marten rabbits, like most other breeds, are notorious chewers. If you are intending to have a bunny as a house pet, be forewarned that you will definitely have to “bunny-proof” your house. This means getting down on the floor and looking at anything and everything that could possibly chewed. Some examples of tasty treats, that bunnies love (and that will have you pulling your hair out about) include wood furniture legs, electrical cords, stereo/DVD/computer wiring, or important papers. Don’t ask me how they know what papers are the important ones, but they do…and they will chew them (or leave bunny tracks on them), if you leave them within reach. Fortunately, products like Bitter Apple are available to help discourage chewing, but the best discouragement is keeping things out of reach. Silver Martens can be litter trained, like most other breeds, though they will usually leave a few bunny tracks around the house. These are NOT to be mistaken for Coco Puffs cereal and just require a little sweep or vacuuming to clean them up.